Multi-platinum Ghost In The Machine in 1981 went to No. 2 in the U.S. Features "Every Little Thing She Does Is Magic" and "Invisible Sun"
This record was cut using a specialist technique known as half-speed mastering. This artisan process results in cuts that have superior high frequency response (treble) and very solid and stable stereo images. In short, a very high quality master that helps to create a very high quality record. This half-speed master was cut by Miles Showell, the Mastering Engineer at the world famous Abbey Road Studios, and comes pressed as a limited edition 180-gram reissue with accompanying download card. 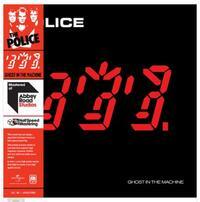 Ghost in the Machine, the fourth studio album by The Police, was released in October 1981. The album reached No. 1 in the U.K. Albums Chart and No. 2 in the U.S. Billboard 200. The band released three successful singles from the album: "Every Little Thing She Does Is Magic", "Invisible Sun", and "Spirits in the Material World". However the song "Secret Journey" was released as a single in the U.S. in place of "Invisible Sun". The album went multi-platinum in the U.S. It was listed at No. 323 in the Rolling Stone 500 Greatest Albums of All Time. Packs a punch. Some great deep bass. Driving rhythm sounds. Better than I remembered the old standard vinyl disc for sure. Worth the price if you are looking for this again.